Few women in eighteenth-century Spain captured the imagination of contemporaries as thoroughly as Doña María de Pilar Teresa Cayetana de Silva Álvarez de Toledo (1761-1802), XIII duchess of Alba in her own right. When Goya visited her estate at Sanlúcar de Barrameda, near Cádiz for eight months from 1796 to 1797, she was thirty-five years old, just widowed, and in the flower of her beautya French visitor to Madrid avowed that "every hair on her head elicits desire." In contrast, Goya was fifty, deaf, married, and still not fully recovered from his debilitating illness of 1792. The duchess, fashionably attired in the popular black dress of a maja, appears before a landscape doubtless representing her estate in Sanlúcar. We may never know the details of their relationship, but Goya clearly succumbed to her charisma: written in the sand are the words, solo Goya ("only Goya"), while she wears rings inscribed "Alba" and "Goya." The painting had great personal significance for the artist since he kept it in his studio long after the duchess's death. 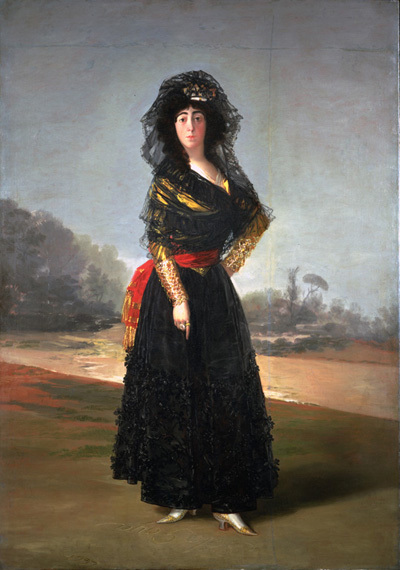 Goya evokes the duchess's personality in her pose and costume which he renders in an impressive display of brushwork and color, particularly in her sleeves and mantilla. Moreover, he enhances the impact of her figure in his handling of the landscape, where the soft, almost transparent glazes evoke a romantic spirit. Although the work originated in unique circumstances, Goya's image resembles that of his royal portraits and, more broadly, recalls those by Velázquez.